the benefits of being the forum owner I can promote my own project. I really want to push on with this again in the next year as I believ it has value which can be utilised to counteract the massive negativity about. I tried to involve a very broad religous community at first making a huge number of contacts, however the reality is it remained with the Spiritualist Groups and ex Fountain members. Of the others I very nearly had the Adelaide Roman Catholic Cathedral and the leading Greek Orthodox Church join in they just needed more time. 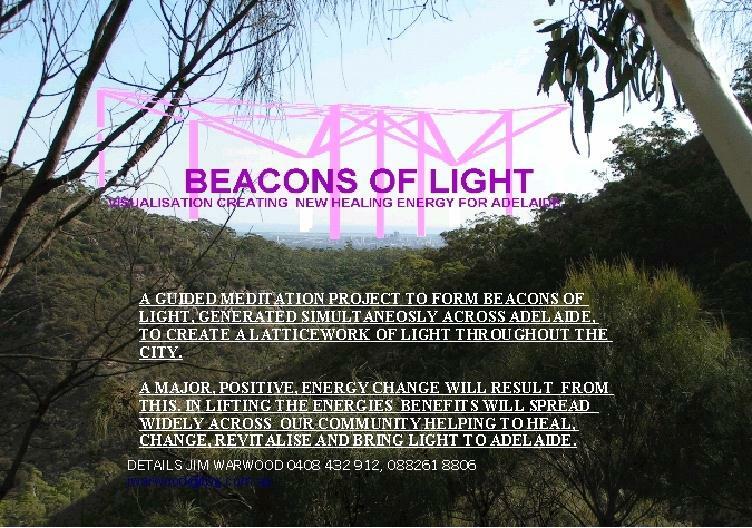 A healing project which will improve the energy levels around Adelaide, bringing love, light, healing, peace and harmony. This is achieved by creating links to God, the Great Spirit, in the form of Beacons of Light, at various locations around the City. The effect will be amplified because a grid of positive energy will be generated between these sites. This energy is transferable to other Cities and can be spread around the world. The existence of energy grids and sacred spirals is well documented. Across our world energy lines can be found, a natural phenomena, although there is evidence that elements that are negatively charged can be harmful to us. There are also energies which arise as a result of human intervention, the most widely known are “Ley Lines” most often linking places of worship(ancient and modern), either to other places of worship, or places of population. “Ley” tracks can be thousands of years old. They reflect the remnant energy created by an intent and concentration of people upon their “God” and a place of worship. The lines may follow the trails that have been walked but also direct lines to link major religious centers both ancient centers, such as Stonehenge and Glastonbury and “modern” Christian sites. Additionally, at many centers, positive energy structures, such as sacred spirals, are formed by the religious focus and can be dowsed. It is possible to replicate these energy lines, a group of people can take a pebble in each palm meditating, focusing on generating a positive charge in the stones. When the pebbles are laid in a line the energy can then be dowsed using the same method as water or mineral divining, a practice with ample proof of accuracy. Add this simple but effective demonstration to the Ley Lines theory and we see the potential to generate an energy field. Elements of this concept have been used, the Fountain Group in England focus meditations on a Fountain in the City of Brighton, to radiate positive energy out across the town because of problems with visiting groups fighting. The impact of the energy change reduced levels of violence, a change that has been researched and documented. Fountain International have extended to many cities around the world. The first extension of Fountain was to Adelaide, a separate Fountain Group, founded by Roger Brown, successfully established a beneficial lift in the energies over Adelaide, focusing on a sacred site at the Fountain in Victoria Square. Using this focus, problem areas were linked to create change, healing, and generating positive energy flows in Adelaide. The Beacon Project links these threads with my intuitive ideas, creating energy lines as a way to spread positive energy over a broad area. Change to help counter negativity, lift spirits and bring healing. A meditative focus on a particular site has the power to create new energy forms. To do this requires an activity, visualising a beacon, a column of light,to link with Spirit, God, the Creator by the use of prayer, meditation and a closing dedication. This is best performed in a group setting, with the intent to achieve this effect. By activating several beacons at once the beneficial effects will be amplified, indeed if a number of beacons are created simultaneously at key spots throughout Adelaide the effects are magnified enormously. The act and specified intent in creating the beacons will cause a resonance linking them to form a latticework of positive energy lines across the City. This will lift the energies of our city, a major improvement leading to positive change. The critical skeleton of beacons now exists, nine beacons joined by a latticework of light. The participants were profoundly affected by the positive energy created during the activity. The grid is for the benefit and involvement of all. Linking to this during any meditative or healing activity allows a flow of positive light which is nearly overwhelming. 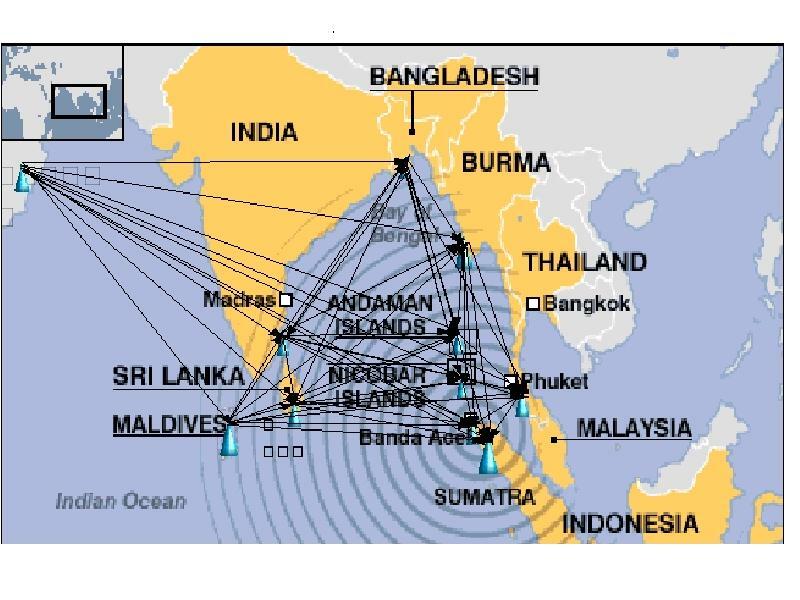 Using creative visualisation techniques beacons were also created and linked to our latticework in the areas worst affected by the Tsunami, the Kashmiri earthquake and the New Orleans Flood. Broader involvement is sought, across all belief systems and denominations. This is an activity that should bridge all denominations in love. As new groups join the grid the energy amplifies. Consider the added benefits if a broad range of beliefs join together in such a spiritual activity to create change. The more that join the greater the size and frequency of the energy lines in the latticework. 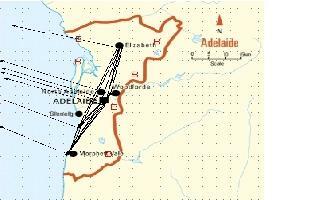 We started in Adelaide but other places can join if they wish. Imagine the power of this grid spread across the world, look at it with an open heart, mind and spirit. If new centres join in, then wherever the Beacons are created, they will link together in the lattice of light because we have a strong framework in place to join onto. been laid. Please help to find ways to link into the latticework of light and join this project. Contact me to find out more or to indicate that you would like to take part. The intention is to re dedicate the beacons, extending the network twice a year, last weekends in June & November. change can be brought to our world. It is our affirmation that we are here to link this place with God through the power of love, forming a Beacon Of Light which will shed new energy about us. In a spirit of harmony Beacons are being created in other places and we know that these energies can be drawn together, a grid of Light spreading over Adelaide, through God's divine power. Our intent is for this energy to be of benefit to and in the service of everyone and everything within its field. As an act of our faith and in the true knowledge of your power we ask you to let these Beacons of Love shine forth. So Be It. Take a moment to think about our prayer and to make yourselves peaceful. Breathe deeply, let the breath flow out of your mouth releasing tension, once, twice, three times. Relax and let thoughts of the day go. Sense God's peace and Love . Feel it grow around you, feel the link with everyone here and then on to all things. Know that we are all as one and we can be as one with Spirit. With a feeling of peace visualise a column of light forming a bridge from here to the Creator. Sense this light as it strengthens and then intensifies. A brilliant stream of energy, representing unconditional love, that is to be used in the service of everything around us. Open yourselves to this light, draw a strand to yourself, to your heart and allow it to fill you completely. Feel the love, the peace, the healing and be aware of the power to create change. Take time for yourself, while understanding that we all share this experience. Now draw back a little, feel how the beacon has developed into a strong focus for good, a powerful indicator of God's Love. Then let your awareness reach out, to sense the other beacons that have been created. Help to forge the links between these by seeing lines of light, joining each one to the other. Imagine the grid of light forming and spreading positive energy widely around us. Become aware of the power of love flowing around everyone and everything touched by this grid. Take some moments to enjoy the feeling as the grid forms and becomes stable. It is now time to come back from our work. Be sure that God, the Great Spirit, will nourish the latticework of light that we have created. Remember to carry the image in your heart and send love to nourish it. Revisit the grid by meditation whenever you can, see how it grows as more places join in. Take a final moment to sense a ripple spread across our land and then the world. Now we will come back from the meditation and return to ourselves. Great Spirit, God, we thank you for joining us in this mission to spread the benefits of your love. We know by this act, by this intent and by this thought change will happen. We dedicate this beacon to your purpose, to bring peace, to bring love, to bring hope, to bring healing, to uplift people, to help people to care for each other, to help people to act wisely, to bring forgiveness and reconciliation. In the awareness of your love we know it will be so and so it will be. I applaud your efforts. However when the word 'ancient' is used I get ready for debate. Many malignant forces are held in Ley Lines. Do you know what ancient forces you are evoking? The Beacon project does not use Ley Lines, or try to evoke them. We are linking with Spirit or God to create columns of energy formed with Spirits help which then form positive energy lines joining each other. As a Dowser taught by a master dowser I am well aware how to check on the positive or negative nature of energy lines be they underground streams natural energy lines or ley lines. The comment about Ley lines is just to indicate man's ability to leave an energy trace on the land, for good or bad. However as most of the lines relate to worship they tend to be positive. Clearly the lines can also coincide with places where there are Remnant Energy Hauntings or atmospheric effects, indeed the negative psychic remnant of violent or tragic events may well be one of the causes for the movement of underground streams becoming negative. Given the nature of the Christian atitude to death and teh grieving process water that has travelled under graveyards can often become negatively charged. On the other hand I am also not one who believes in evoking evil energies, which suggest something beyond the natural laws of the universe. I am aware, however, of mans ability to use their own natural psychic force for ill purpose and even leave a remnnant trace of that behind. In reverse I believe that such efforts can never defeat that energy used in conjunction with Spirit for a higher purpose. As a Spiritualist remember I do not believe in heaven and hell albeit I accept that some of the spirits that have crossed over have a fair way to go before they begin to progress so any contact they make is unlikely to be for good. Given these represent the lower levels I know that any problems can be stopped by ensuring contact is with those spirit guides working withiin the light of Spirit by ensuring a sensible approach to gaining protection. Ley lines are the paths of natural telluric energy and like other energies, seem neither for or against humanity. As a dowser that is not my findings, Ley Lines are natural but created by our own energy. What are known as the Currie and Hartmann Grid are as you say natural but potentially dangerous to humanity on teh intersections of the negative lines. This is especially so when in conjunction with negatively charged (black) streams of underground water or negative Ley Lines. By the by we are working here with natural universal energy not of Spirit except that Spirit created these energy lines or this psychic force in creating the universe and mankind. I find it equally important here to de mystify the whole issue and not get entangled with old belief systems. When we get into this area we can do so, especially with views of the old Celtic religions. Once again my findings are the residual memory of all the old religions including the mis recording of Christian history leave us exposed to an acceptance of so called truths which are not there. I am in agreement with you here, Jim, as everything, as Silver Birch frequently said, is ruled by Natural Law. Learning and understanding and working with the Universal Laws is important for our mental, physical, emotional and spiritual health. Best wishes with your endeavours and I look forward to reading the results of your work in the years to come - whether I am in this world or the next. Funny I am drawn back to this project after all the disasters in the world. I remember when I first did this I was contacting almost every possible group around Adelaide who may have some interest. Suddenly I received a phone call from a UK visitor a Michael Poynder. He has written several quite interesting books and said that his then latest "Lost Science of The Stone Age" was in line with the ideas of the Beacon Project which he felt was scientifically valid.